Educating students with disabilities was not always required. In fact, before much attention was paid to the subject, several parent activist groups filed suit on behalf of their children with disabilities who were being denied education. The functional approach in transition planning is used to create appropriate goals in physical education. This model is based off the work of Flexer et al. 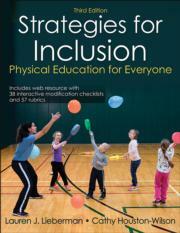 (2013) and incorporates legal requirements and best practices in special education. Researchers have indicated that standardized testing protocols may present challenges in adapted physical education. For example, Block (2016) noted that outcomes from standardized tests have been misused in determining IEP goals and objectives. Part II offers 38 teachable units—a sizable leap from the previous edition’s 17—complete with assessment tools for curriculum planning. Here you will learn specific strategies for inclusion as you use a step-by-step implementation guide for 14 elementary units, 11 sport units, 8 recreation units, and 5 fitness units—all with potential modifications. Adaptations are categorized by environment, equipment, instruction, and rules.